There are certain foods that can be thought of as a double-edged sword, in terms of keeping your body healthy and cleaning your teeth at the same time. Your teeth are a direct reflection of your whole body wellness. If you have a healthy diet, then your teeth and gums will be healthy as a result. 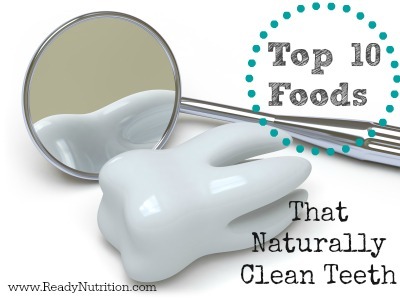 As we continue exploring natural alternatives to cleaning teeth, we must mention these top ten beneficial foods for the teeth. Tea – Infused herbal teas a way to promote good dental health. Green tea contains polyphenol antioxidant plant compounds that reduce plaque and help reduce cavities and gum disease. Tea may help reduce bad breath as well. Further, rinses can be made by preparing an herbal infused tea in the usual way, or by simply stirring herb powder into water. Hold the rinse in the mouth for a few seconds or up to several minutes, gargle, and spit out. Dairy Products – Milk and yogurt are good for teeth because they contain low acidity, which means that wearing of teeth is less. They are also low in decay-inducing sugar. Milk is a good source of calcium, the main component of teeth and bones. Cheese – Cheese contains natural cavity-fighting agents as well as contains vitamins to strength the teeth and enamel. The calcium and phosphate, which helps balance pH in the mouth, preserves (and rebuilds) tooth enamel, produces saliva, and kills bacteria that cause cavities and disease. Fruits – Some of our favorite fruits and vegetables are natural abrasives and eating them scrubs your teeth in a natural and harmless way. Fruits such as apples, strawberries and kiwis contain Vitamin C. This vitamin is considered the element that holds cells together. If this vitamin is neglected, gum cells can break down, making gums tender and susceptible to disease. Vegetables – Vitamin A, found in pumpkins, carrots, sweet potatoes and broccoli, is necessary for the formation of tooth enamel. Crunchy vegetables such as carrots, cauliflower, brocolli and cucumbers may also help clean gums because of the increased chewing it takes to break it down. Onions contain antibacterial sulfur compounds. Tests show that onions kill various types of bacteria, especially when eaten raw. Celery protects teeth by producing saliva which neutralizes acid that causes demineralization and cavities. It also massages the teeth and gums. Fresh herbs – Chewing on herbs like parsley, cilantro, and mint helps decrease odors caused by a buildup of bacteria. Dried herbs do not do as good of a job as fresh herbs do, however, dried herbs can be used in mouth rinses. Seeds – Especially sesame seeds reduce plaque and help build tooth enamel. They are also very high in calcium. Animal Protein Sources – Beef, chicken, turkey, eggs and especially fatty fish like salmon contain phosphorus which, with calcium, is one of the two most vital minerals of teeth and bone. Water – Water cleans the mouth and produces saliva that deposits essential minerals into the teeth. It keeps gums hydrated and washes away particles from the teeth. Whole Grains – Whole grains contain B vitamins and iron, which help keep gums healthy. Further, the magnesium that is also present is an important ingredient for bones and teeth. In addition, whole grains are high in fiber. High-fiber foods keeps saliva flowing, which helps create mineral defenses against tooth decay. Foods such as bran, brown rice, whole-grain cereals and pasta are good choices for whole grains. Was once told by a dentist that if everyone ate watermelon every day we’d never need to have our teeth cleaned! Im sorry but the information above is not true. Tea stains teeth, even green tea, and its #1. All the rest is also not good info. Its also too general. Carrots, apples and celery should be the top. The foods mentioned are not in a particular order and all are beneficial in supporting healthy teeth and gums, as well as assist in cleansing the teeth. As I mentioned in the article, the green tea is to be used as a medicinal rinse (or can be consumed for other health related benefits). Ya we al know that. If you brush your teeth 2 times in the morning you will have sqeaky clean teeth! Question for all those who claim nuclear power is unsafe and a catastrophic danger do you have any idea how many nuclear reactors run every day all over the world? THOUSANDS. Nuclear plants are all over the globe, including nations with far less stringent safety restrictions than we have (North Korea much?). Countless nuclear subs and aircraft carriers run almost 24/7 365 all around the world. Milk and Dairy isn’t good for the teeth or any part of the body. All the necessary calcium can be obtained from fruits and vegetables! My dog uses carrots to clean teeth. He does not eat them, he shreds them.